In a deal valued at a whopping $69 billion, CVS Health Corp. plans to buy Aetna, Inc.
At over 33 times trailing net income, Aetna "isn't exactly selling at a moment of weakness." And since the offer is mostly in cash, it will strain the CVS balance sheet. If the deal finalizes, it would merge the nation's largest pharmacy chain with a major healthcare insurer, representing one of the largest healthcare deals of all time and the biggest deal in 2017. The partnership will capitalize upon CVS' existing 1,100 low-cost MinuteClinics, which will soon expand its low-level treatments. Cost Cutting. The merger is expected to produce $750 million in cost savings. 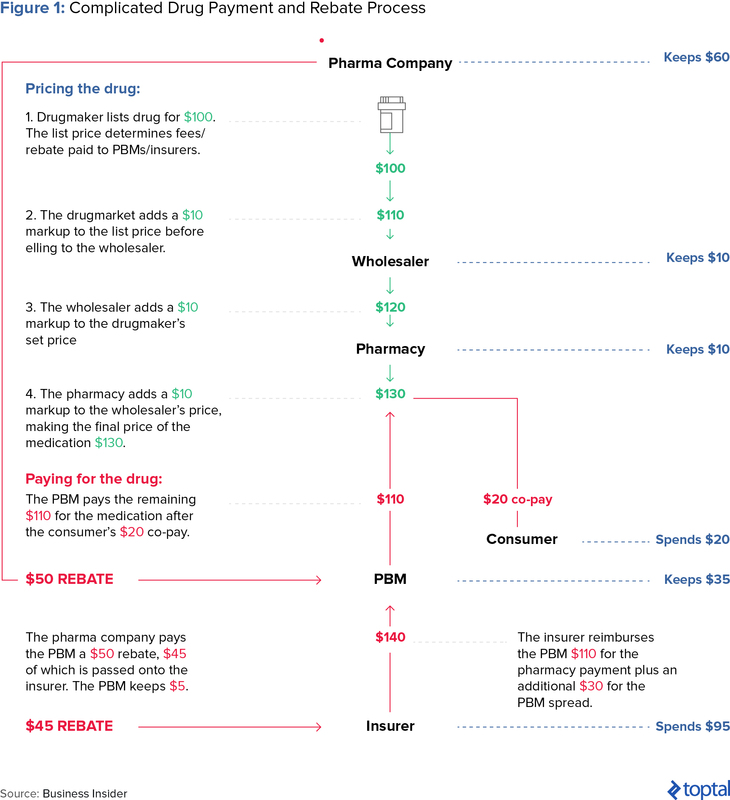 The system involves a complex network of payments and rebates, but ultimately the deal would place a pharmacy, insurer, and PBM under one roof—keeping much of the money changing hands under the same roof. Expanded Services as a Competitive Edge. The deal would leverage CVS' 9,700 storefronts and 1,100 MinuteClinics. By focusing on preventative care and minimizing hospital services, which drives at least 70% of medical costs, the total cost of care can be minimized and differentiate them in the market. Despite Threats from Amazon, the real race is with UnitedHealth. Amazon has obtained licenses allowing it to sell drugs, amongst other items, in 12 states. It's possible that CVS and Aetna joined forces to counter a ruthless competitor. However, the real threat might be from health giant UnitedHealth, the nation's largest health insurer. UnitedHealth has long been pursuing a strategy where it expands into drug dispensing and patient treatment. Traditional Caregivers under Pressure. It's no secret that the hospital business is becoming commoditized and non-traditional entrants are introducing fresh options. This is reflected in the number of healthcare-related venture funding deals, which grew 200% between 2010 and 2014. CVS and Aetna want to pursue value-based care, in contrast to the current fee-for-service system, which incentivizes treatment by volume. Unsurprisingly, this will be a blow to hospitals like Tenet Healthcare, HCA Holdings, and Community Health Systems. Increased Merger Activity. Three days after the Aetna and CVS announcement, UnitedHealth purchased DaVita Medical Group, acquiring its 300-doctor nationwide clinics, for $4.9 billion. This will expand UnitedHealth's Optum unit, which already includes 30,000 doctors. UnitedHealth has spent $14 billion on deals in 2017 acquiring assets. Unclear How It Will Affect Consumers. Some experts believe that CVS and Aetna will provide greater convenience to consumers, insisting that the deal will help patients navigate the complicated system. Others highlight the fact that Aetna's outgoing CEO would reap $500 million if the deal closes. Candy, cosmetics… and medical care? In a deal valued at a whopping $69 billion, your favorite stop-in, CVS Health Corp., plans to buy Aetna, Inc. At over 33 times trailing net income, Aetna “isn’t exactly selling at a moment of weakness.” And, since the offer is mostly in cash, it will strain the CVS balance sheet. If the deal goes through, however, it would merge the nation’s largest pharmacy chain with a major healthcare insurer, representing one of the largest healthcare deals of all time and the biggest deal in 2017. The partnership will capitalize upon CVS’ existing 1,100 low-cost MinuteClinics, which will soon expand its low-level treatments. News of the deal was not unexpected; CVS Chief Executive Larry Merlo called the deal a “natural evolution” of the two companies since they have been “close partners” for several years ever since CVS became a PBM for Aetna’s 22 million members. It follows on the heels of proposed horizontal mergers between industry competitors—insurers Aetna and Humana, Cigna and Anthem—which raised antitrust concerns and were blocked by a federal court. However, the CVS-Aetna venture would be a vertical merger between companies that do different things within the same industry, and is thus more likely to be approved. Many view the move as evidence of a transforming healthcare landscape given increased industry consolidation and political uncertainty over the future of national healthcare programs. This article breaks down everything you need to know about the deal; we’ll brief you on the motivations behind the merger, potential market effects, and outstanding issues. Amidst the uncertainty over the Affordable Care Act and potential reductions for government programs like Medicare, health companies are now reexamining their business plans and partners. Aetna and CVS are no different as they look to cut operational costs and establish a competitive edge in this landscape. According to CVS CEO Larry Merlo, the merger is expected to produce $750 million in cost savings. This is, in part, because the drug landscape involves so many middlemen. The five major players include: drug manufacturers, wholesalers, pharmacies, insurers, and pharmacy benefit managers (PBMs). PBMs serve as middlemen between manufacturers and insurers, usually working for employers and health plans to select which drugs are covered and negotiate discounts. The system involves a complex network of payments and rebates, but ultimately the deal would place a pharmacy, insurer, and PBM under one roof. Put simply, the obvious benefit is that it would keep much of the money changing hands under the same parent company. The process from manufacturing to consumer is illustrated below. The deal would help leverage CVS’ 9,700 brick-and-mortar storefronts to improve access to preventative care and minimize expensive emergency room visits for Aetna’s members. Currently, CVS operates 1,100 MinuteClinics which offer basic services like flu shots and physicals. These services, in combination with data from Aetna’s medical records, would offer consumers certain preventive services for free and make certain drugs available in CVS pharmacies. Thus, the MinuteClinics would become key locations where Aetna customers, and customers of rivals, can receive low-level care. The goal is to help individuals realize savings by going to a retail store to treat minor symptoms or monitor their health, transforming how care is delivered. By focusing on preventative care and minimizing hospital services, which drives at least 70% of medical cost, the total cost of care can be minimized and differentiate them in the market. CVS also plans to eventually deliver care to customers’ homes as a method of saving premium dollars paid by Aetna clients, employers, and individuals covered under Medicare and Medicaid. 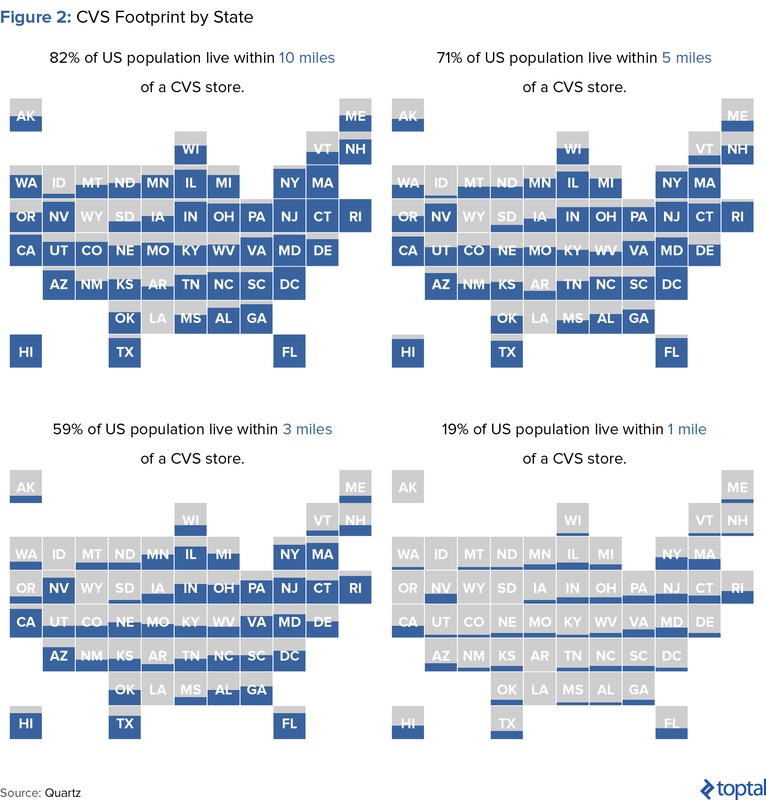 With regards to footprint, CVS currently operates 10,000 drugstores nationwide, which are within 5 miles of 71% of the country’s population. For the sake of comparison, only 34% of US households are within 5 miles of an Amazon-owned Whole Foods storefront. Still, skeptics insist, this strategy might not prove successful in execution. Hurdles include significant monetary and time investment to transform drugstores into a credible medical setting. Its abilities “will be hamstrung by a heavy debt load, a huge learning curve and a tricky integration process.” Others are wary as to whether the care will be disjointed and of subpar quality. As Greg Burke of the United Hospital Fund puts it, “It would probably be unsettling to people coming in to buy socks to have someone with a bleeding head come in for stitches.” And, as critics point out, when comparing total CVS clinics to those with MinuteClinics, the picture seems less rosy (see Chart 1). According to Toptal Finance Expert Sebastian Fainbraun, “The deal will be more transformative for Aetna as it will give them better pricing for drugs, a direct channel for quick care, and another touchpoint to the consumer. 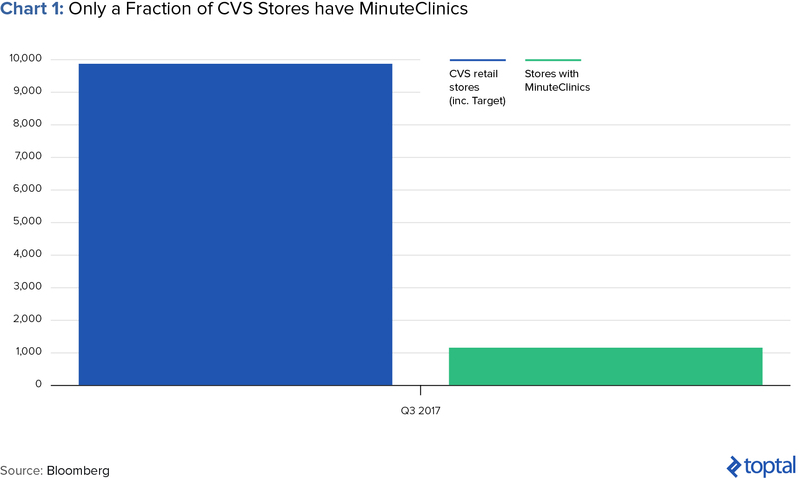 For CVS, it is a lifeline because Walgreens, Walmart, and Amazon will eat their lunch.” In 2016, three-fourths of CVS’ retail sales (totaling $81 billion in revenue), including stores, online pharmacy websites and long-term-care pharmacy operations, were from the sale of prescription drugs. And the pharmacy-benefits business has been growing at a faster rate than the retail business, jumping 20% in 2016 compared to 13% for retail operations. Everybody discusses Amazon as a game changer—and with good reason. Amazon has established dominance and obliterated incumbents in publishing, consumer electronics, cloud services, and most recently, food, with its Whole Foods acquisition. Earlier this year, Amazon indicated that it was considering entering the pharma industry, which sent stocks of pharmaceutical middlemen south. Amazon has obtained licenses allowing it to sell drugs, amongst other items, in 12 states. It’s possible these were secured to allow the sale of medical devices. However, analysts suspect it may have larger ambitions, causing CVS and Aetna to join forces and establish their foothold to counter a ruthless competitor. 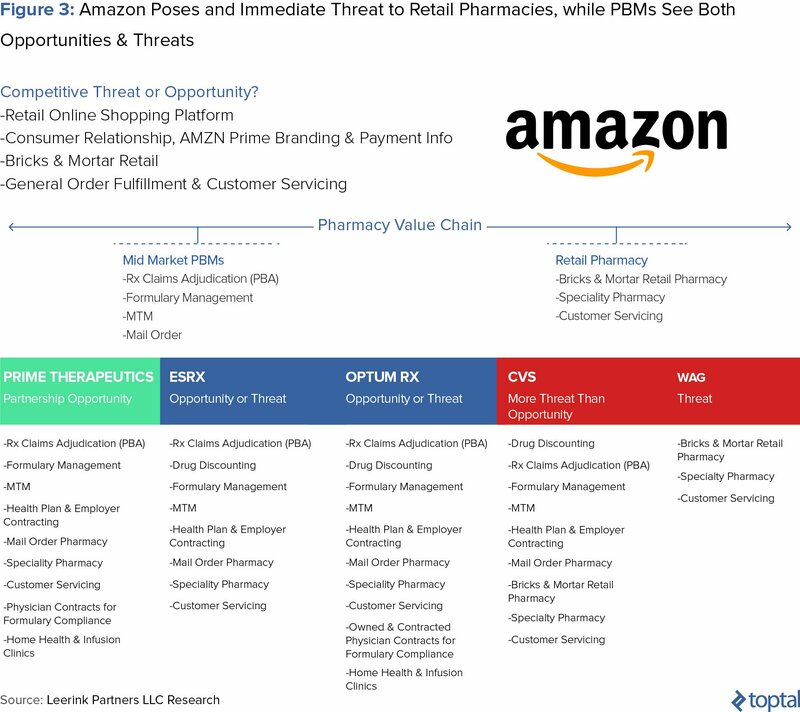 Though Amazon could potentially affect any part of the pharmaceutical supply chain, Leerink Partners analyst Ana Gupte believes it is most threatening to retail pharmacy chains like Walgreens, CVS, and Walmart. This is because Amazon is set to acquire cash-pay and mail-order customers, then eventually move into the pharmacy-benefits manager and retail pharmacy business. However, amidst the noise that often surrounds discussion of Amazon, the real threat might actually be from health giant UnitedHealth. UnitedHealth is the nation’s largest health insurer with more than 45 million US members. UnitedHealth has long been pursuing a strategy where it expands into drug dispensing and patient treatment. In 2007, UnitedHealth merged with CatamaranRx, the then fourth-largest pharmacy benefit manager (PBM), into its OptumRx PBM. UnitedHealth is set to reach $200 billion in revenue this year. It owns over 400 surgery centers and urgent care clinics, runs medical practices for 22,000 physicians nationwide, and OptumRx fills over 100 million prescriptions per month. It’s no secret that the hospital business is starting to become commoditized and non-traditional entrants are introducing fresh options. This is reflected in the number of healthcare-related venture funding deals, which grew 200% between 2010 and 2014. New, redesigned processes often focus on bringing care to the patient, which is appealing when compared to outdated hospital systems which subject patients to long phone holds and crowded parking lots. Therefore, in an attempt to lower premiums, Aetna and CVS are aiming to streamline financing and delivery and care—to get upstream of hospitalization. CVS and Aetna want patients to receive care conveniently and in a timely manner (value-based care), in contrast to the current fee-for-service system, which incentivizes treatment by volume and fuels skyrocketing healthcare costs. Unsurprisingly, this will be a blow to hospitals like Tenet Healthcare, HCA Holdings, and Community Health Systems. Three days after the Aetna and CVS announcement, UnitedHealth purchased DaVita Medical Group), acquiring its 300-doctor nationwide clinics, for $4.9 billion. This will expand UnitedHealth’s Optum unit, which already includes 30,000 doctors in its network. In fact, UnitedHealth has spent $14 billion on deals in 2017 alone, acquiring assets and establishing its advantage. However, its strategy has been to make reasonably-sized acquisitions; its biggest deal was its purchase of PBM Catamaran Corp for $13 billion in 2015. This figure isn’t insignificant, but it pales in comparison to the CVS-Aetna merger. According to Professor Craig Garthwaite of the Kellogg School of Management, it’s interesting that it’s the insurers integrating care delivery into their operations, in contrast to large health systems like Kaiser Permanente, which has been directing members to its hospitals and doctors. 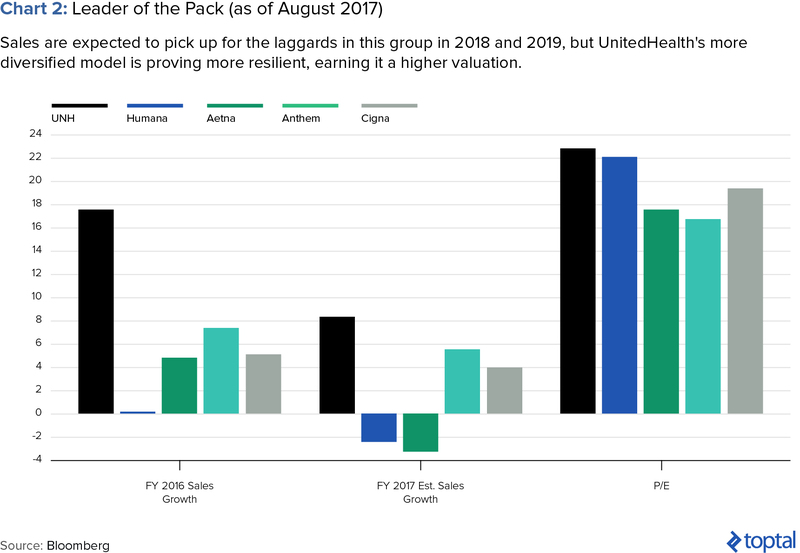 Steady diversification is a strategy that has been successful for UnitedHealth—as of August 2017, its diversified model was proving more resilient than its competitors (see chart below). As noted previously, UnitedHealth has long been the leader in terms of strategic acquisitions. However, the CVS-Aetna deal could cause a ripple effect in the industry. If successful, the merger will leave Express Scripts as the only remaining large PBM not tied to an insurer. Many speculate that more cross-industry deals are expected, in part because the current environment is increasingly consolidating functions—whether it’s seeing doctors, surgery, or prescriptions. Some experts believe that CVS and Aetna will provide greater convenience to consumers. One such believer is Gerald Kominski, director of the UCLA Center for Health Policy Research. He maintains that, “It might be similar to an airline buying a rental car company, so it can offer package deals to its customers…This is a bold move that is more likely to benefit customers.” Of course, leadership at CVS and Aetna have been making the same assertions—that the merger can simplify matters for patients and lower out-of-pocket costs: “I think really people are confused…They’re wandering through the system, multiple doctors, multiple medications” said Aetna CEO Mark Bertolini. However, others disagree. Some critics highlight the fact that Aetna’s outgoing CEO would reap $500 million if the deal closes. Some are concerned that the healthcare ecosystem will resemble siloed kingdoms where consumers are locked into separate ecosystems of pharmacies, doctors and healthcare clinics depending on their insurance provider. And, since individuals often change insurance plans, B. Douglas Hoey, the chief executive of the National Community Pharmacists Association insists that “you may be bounced from kingdom to kingdom.” Gerald Friedman, a healthcare economist at the University of Massachusetts Amherst, agrees: “This is not good for consumers…they will be lucky to be no worse off.” The potential for the merger to limit competition and thus decrease consumer choice leads to speculation around whether the Department of Justice (DOJ) will block the deal. While historically vertical mergers have been considered less anticompetitive than horizontal mergers, in November 2017 the DOJ prevented the vertical merging of AT&T and Time Warner. The CVS-Aetna deal may not be the first of its kind, but it certainly is evidence of a changing healthcare landscape. It may not be revolutionary, but it is brilliant. Of course, whether the operational cost cutting and consumer-aiding visions will be realized are to be seen. What is the meaning of horizontal merger? There are typically two types of mergers: vertical and horizontal. Horizontal ventures occur between industry competitors while vertical mergers occur between companies that do different things within the same industry. Horizontal ventures are typically a higher anticompetitive risk than vertical ventures. What is an example of a vertical merger? An example of a vertical merger is the proposed CVS-Aetna deal. It would bring together the nation’s largest pharmacy chain with a major healthcare insurer. If it goes through, it would represent one of the largest healthcare deals of all time, and the biggest 2017 deal.